That “The Vision” is a disappointment is a product of both design and misstep. By design, this is an episode all about preparation for what’s to come, an extended piece of table-setting for both Bjorn’s journey to Rome and Ragnar’s return to England. Such an episode can be necessary and still be compelling, letting Vikings do the world-building and character development it’s done so well, as well as getting the new (half-) season’s plot up and running. But while there are plenty of each in “The Vision,” the episode sees Vikings indulging in some of its worst tendencies, while, like Ragnar, rushing right into the coming storm of this season without adequate preparation. Unsurprisingly, it’s Ragnar’s half of the episode that works best. It has Travis Fimmel after all, whose singular presence only seems more and more irreplaceable the more the show prepares for life without him. After last season—where Ragnar Lothbrok well and truly lost his will to lead, his ability to pull miraculous success from seemingly inevitable defeat, and his mind, for much of the time—it was still tempting to imagine that this wandering, filthy Ragnar returned to Kattegat with some of his wonted magic either restored or transformed in his travels to something new, and perhaps wiser. Instead, as tonight’s disastrous, abortive raid on England sails headlong to a watery grave, we see that, apart from his undiminished enigmatic magnetism, Ragnar is still quite lost. And, speaking of Ragnar’s magnetism, it’s really only working on the audience at this point, and not his people or family. The episode opens with the ragged Ragnar in Kattegat’s town square, accosting a passing farmer about joining his raid. Fimmel adopts all Ragnar’s impish persuasive moves, flashing smiles and those eerie eyes as he works to win over this unremarkable man, only to see the contemptuous farmer—whose family was among those lost in the massacre of the English settlers—literally swat Ragnar’s hand away, tell the king off, and then, shockingly, spit in his face. Fimmel’s reactions are a book in themselves, Ragnar’s mingled and warring pride, shame, guilt, and anger flashing, strobe-like, until Ragnar smilingly answers, “Thank you for your time.” It is a shock, seeing Ragnar brought so low, and disrespected so publicly, although that the farmer then has to shout, “I believe the gods have deserted you! You are on your own! Everyone hates you now!” is Vikings’ writing at its most overdone and prosaic. Sadly, there’s a lot of that in “The Vision.” Ivar, defiantly preparing to join his father’s raiding party, confronts his mother’s tearful objections with a speech laying out their heretofore implied relationship for us. Mother all my life you have been suffocating me. Paying me so much special attention. Why? Why Ivar? Because I’m a cripple. Poor Ivar. Now poor Ivar has a chance finally to prove himself with the gods. I will not let you take that away from me, mother. I don’t care if I die. Mother, I love you. One day with my father. Be a man. That’s worth a lifetime of pity. It’s not that Alex Høgh doesn’t deliver Ivar’s speech well, it’s that it’s all stuff we know, or at least have intuited. Vikings has always been best with the least speechifying, when actors like Fimmel, Katheryn Winnick, Clive Standen, Gustaf Skarsgård, and others speak in gesture, action, body language. They can convey a great deal, and more eloquently, than pages of Vikings’ sometimes plodding dialogue. Høgh’s burning, spooky eyes have already told us all this—as does Ivar’s furious, wrenching, painful crawl when he tries to attack taunting brother Sigurd. Jerking forward on his useless legs, snarling in rage as Sigurd pulls away the chair he’s using for support, then hurling himself forward on his powerful arms to the door and bellowing his wordless hate after the departed Sigurd—that sequence is powerful, and tells us what Ivar’s speech need not. Similarly, “The Vision” walks back what had seemed so interesting about Margrethe. Last episode positioned the unfortunate slave girl as someone with the smarts and guile to not only manipulate the humiliated, impotent Ivar into following his father’s legacy (and, you know, not murdering her) but to become a major player in Kattegat’s incessant intrigues. Tonight, she’s nothing but a scared girl, telling preferred lover Sigurd how afraid she is of Ivar (and how he was unable to perform) with no trace of her previous agency. Last week, she was a desperately clever woman working the anges, here, she’s a victim, and a plot point. Throw in Ubbe’s response to Sigurd’s report of their brother’s actions (because of course Sigurd can’t wait to break his promise not to tell), that he, too, is terrified of Ivar, and the unpromising drama of characterization by blunt dialogue continues. Even when it comes to Lagertha, the episode stays on the surface. It’s inevitable, and long overdue, for the current and former wives of Ragnar Lothbrok to square off, especially since they both occupy neighboring positions of power. And Winnick, as ever, carries such authority in her small frame and expressive yet guarded visage that her steely, “I forget nothing” in response to Aslaug’s “You forget, I am the queen” should have Aslaug watching her back, queen or no. Come to see off son Bjorn as he teams with former allies King Harald and his brother Halfdan, Lagertha is there to play nice—up to a point. Offering to make a co-sacrifice with the queen for the raid’s success, she, instead, arrives at the ceremony to see Aslaug—face painted into a grotesque mask (she looks a lot like Darth Maul)—bleeding the chosen animal on her own. I know you can hear me. I want you to know that I can never forgive you for taking away my husband and my world. And look what you’ve done with it. You call yourself queen but you will never be queen in Kattegat. 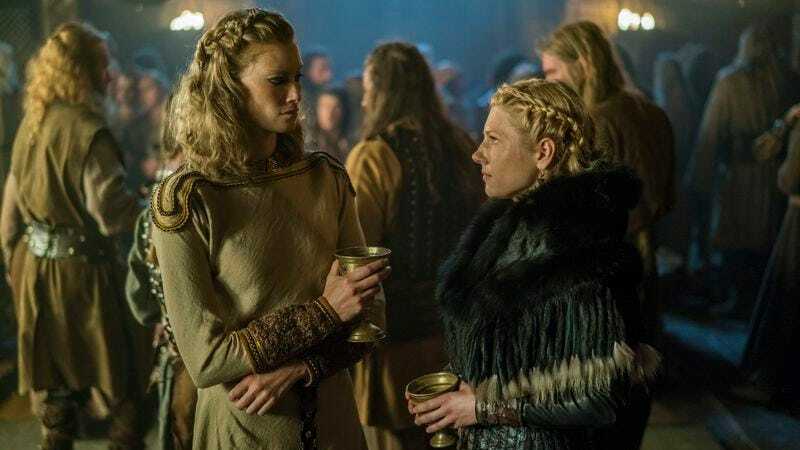 Sold also with Lagertha’s contemptuous flick of ceremonial blood in Aslaug’s face, the exchange sets up another of the season’s storylines, as Lagertha’s out to reclaim the life she lost. Still, it bears asking, why now? Lagertha denigrates what Aslaug has done to Kattegat, but, from what we see, the place is a bustling trading center, and a prosperous one, still sending out raiding parties as in Ragnar’s day. At any rate, Winnick makes Lagertha’s true motivation as interesting as it is mysterious. Aslaug has always paled in comparison as far as Vikings’ female leads (and Ragnar’s partners) go, a function both of Alyssa Sutherland’s colorless performance, and of the narrowly villainous and sometimes silly conception of her character. Here, again, she talks up her claim to mystical powers and legendary lineage, which would be just an appropriately tiresome character trait, if Vikings didn’t keep trotting out Aslaug’s “gift” as something real. The show’s relationship with the supernatural has always been problematic, walking a queasy line between depicting its characters’ belief in outside forces as integral to their way of life and hinting that such forces really exist. We already have Game Of Thrones, and any time the Seer’s cryptic but spot-on prophecies or, here, Aslaug’s prophetic dreams of Ivar drowning in a storm come true, it drags Vikings’ down with it. Before leaving on his doomed voyage, the scene where Ragnar finally speaks to Aslaug is easily the best of the episode, if not their best scene together. Summoned in fury when Aslaug discovers Ivar plans to sail with her husband, Ragnar suddenly appears in her chamber, his arrival signaled by his dirty hand reaching into frame out of the darkness behind her. In an episode filled with speeches that don’t land, Fimmel makes Ragnar’s quiet appeal to his estranged wife deeply moving, only helped by Sutherland’s wordless tears, and how gently Ragnar strokes her hair and face while he speaks. My wife. And mother of my sons. We both know that love was not what brought us together. But you’ve endured me. You suffered my words and my neglect. But you never turned our sons against me. I am sure that there are times when you have hated me. But you never poisoned their minds, or stopped them from loving. And for all of that with all my heart I am grateful to you. Much of what Ragnar has said since returning to Kattegat has sounded like goodbye, and here (while he does conveniently omit reference to the time he beat Aslaug), Ragnar’s regret and earnestness mark him as a changed man, reaching out in sincere affection, and regret. It’s just that we do not know what he has changed into. As far as cliffhangers go, ending the episode with Ivar and Ragnar seeming to drown is a non-starter—I mean, c’mon. But the shocking suddenness of Ragnar’s failure does put to bed once and for all the idea that this Ragnar Lothbrok is working some of his old winning magic. No, this season continues a series where we cannot count of Ragnar to prevail, a narrative choice that could, indeed, make for unpredictably compelling storytelling. It remains to be seen, however, if the writing will be as ambitious. Harald’s been conquering, as Bjorn notes, reminding him of his onetime promise to become king of all Norway. Harald defers that he could never challenge the great Ragnar Lothbrok, something both men wordlessly acknowledge as no longer true. Still, there’s a palpable sense of pragmatic camaraderie among the gathered warriors, all scarred veterans of Ragnar’s failed siege of Paris. Fimmel’s delivery of “That was easy,” after sheepishly asking his son for ships is prime Ragnar. I love the way Fimmel plays his hands restlessly over that horse as the farmer berates Ragnar. Fimmel’s physical acting is always thrillingly alive on screen. Precious little Floki tonight, but him greeting Harald with a fart noise in his ear made up for it. Good old Bjorn cannot help but betray his feelings in his face. After his poetic words as he sets sail (“What a beautiful dragon you’ve built for us, Floki. Now let’s fly her to Rome”), he tries to set his jaw in resolution, but Bjorn Ironside knows he will never be Ragnar Lothbrok. Sigurd might be a little prick, but he reminds the imperious Aslaug of how he witnessed her infidelity with Harbard, and that people say she bewitched Ragnar.